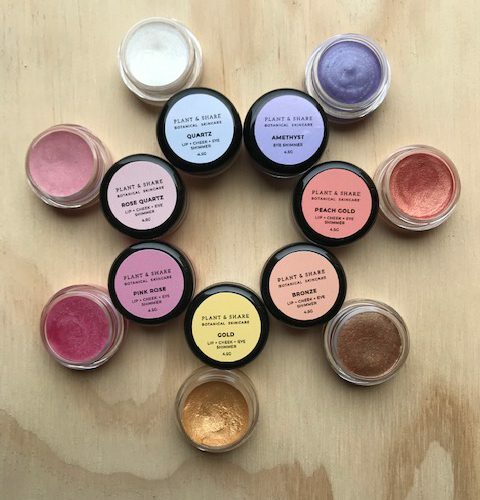 Plant & Share Botanical Makeup has been designed for children with light pretty colours that can be layered for a deeper colour if required. The colours are crystal inspired and can be teamed up with our “5 FREE” Nail Polish and crystals to make lovely gift sets. They are made from 95% organic ingredients including cocoa butter, shea butter, sweet almond oil, castor oil, calendula oil, beeswax and skin safe mineral micas. USE: Lightly apply to lips, eyes or cheeks with fingertips or a makeup brush. Layer product for a darker finish. Patch test before use. Store at room temperature, out of direct sunlight. If product liquifies, due to high temperatures, stir and place in a cool place to restore to a solid state.